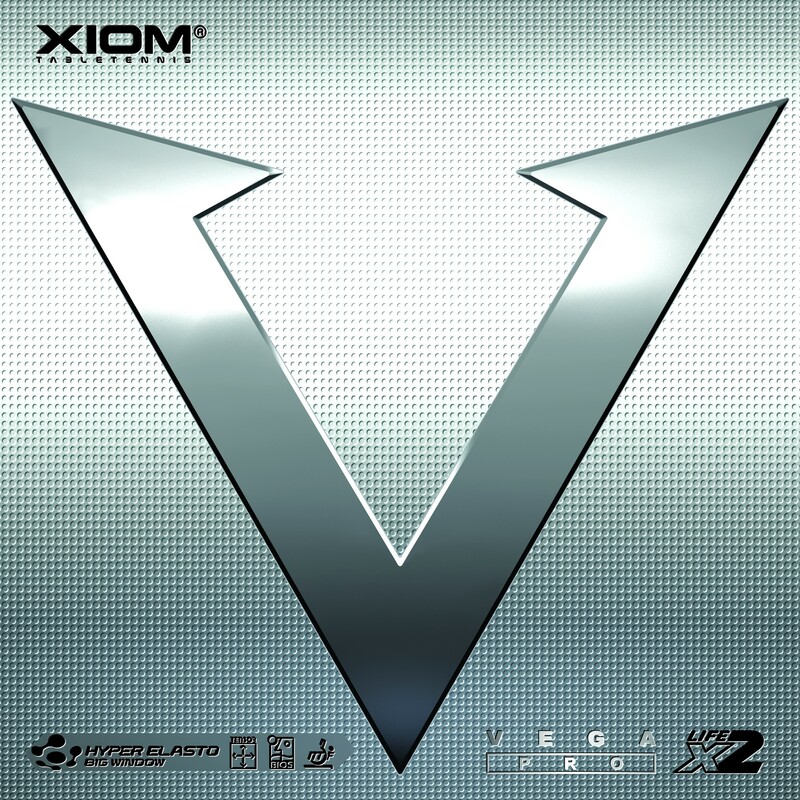 Xiom Vega Pro was introduced at the end of 2009, breaking into the new decade and setting a precedence of Xiom's ability to produce quality rubber. At this point in time, there were next to no options that could compete with with the recent releases of a certain well known Japanese company. Vega Pro was among the first tensor rubbers that was truly able to compete with the best. Featuring a high arc, high spin, and high power; Vega Pro is a great choice for anyone looking for a consistent offensive rubber with durability to last. Always. On any blade works just fine on backhand for me. Good rubber. Control and good amount of spin in the rubber with excellent control. If you like control the game, have a easy block, good rotation, this rubber its for you. Xiom vega pro have a medium/hard sponge hardness (45-47°). This one have a lot of spin an control. One of my favorite BH rubbers. Great speed with stable trajectory. The only negative is the weight. This rubber is heavier than average due to the dense sponge. All around good rubbers ! Fast, light with lots of spin, it is a good rubber from Xiom. Good spin and speed although slightly less spiny than Tenergy 05. Lasts twice as long and less than half the price of 05. All around, this is an excellent rubber! This rubber is good at everything, not superb in any one particular area. It has more touch/control than Tenergy 05. Blocks better and feels better than Hurricane 3 Neo. Lasts longer than Xiom Sigma 2 Pro. Paired with a fast blade, it is also good for advanced players. Excellent performance per price ratio if there is a such thing. Same quality from many years. A go-to for any level of skill. High tension rubber allows for great control and power. Spin was also very good. Can't go wrong with this. With proper stroke, the reward is high. Very good FH rubber, loop, hit and nice control. Combo with Vega Elite BH on a Hinoki blade is just heavenly. Great rubber. Very high control. Well suited to my aggressive allround game. Best service!!! Давно уже известная и проверенная накладка. This tensor rubber is good for backhand. The throw angle is rather high. Amazing rubber. Really fast with amazing control. Give nice power for my top spin. Great rubber, I love it! When comparing apples to apples (similar hardness from other Euro tensors). It's ok. I use this rubber on my FH. Very good speed and spin ratio. It has medium to low medium throw arc. Относительно недорогая современная тензорная накладка. Не очень быстрая, с хорошим контролем и вращением. It is packed with lot of speed, with my 7 ply blade, Tibhar Samsonov Pro Black Edition. It's totally cool with my backhand. and its very nice .. fast and spinny.. also with good block. Satisfied, but need more time to review. Моя любовь с первого взгляда! Rubber quality is excellent. Sponge is hard with good power in looping and controlling the ball in short game and away from the table. Good for smashing, pushing and blocking. Good spin in serving and looping. Durable rubber. Good rubber for both forehand and backhand. For players love to play close to the table ! Very good quality and reliable rubber. Heavy spin can be generated with proper technique and stroke. Just ok for passive situation, hard to block heavy spin. More suitable to FH. I use it on backhand. Can Play everything i want with a Great Control. This is a light rubber with great control. I love how light weight it is. You can pair it with heavier blades. It has pretty good spin. The speed is ok. Overall, it's not bad. You can use it for either forehand or backhand and you will do well. Would recommend to try if it's on sale. Uso borracha no forehand. Parabens tb11 pelo excelente trabalho. If anyone play close to mid distance to the table then Xiom Vega Pro is the answer , even its speed cant not compare to Butterfly Tenergy 05 , but you can save a chunk of money ( 1/3 when on sale ! ) , and i am very happy with it ! I would recommend this rubber to all TT enthusiasts out there who want to step up from Beginner/Intermediate to Advanced level. This is a non-tacky ESN rubber which does pretty much everything that is needed in a offensive style of play. The balance between speed, spin and control is the best. Pair it with a all wood blade and you are good to go. Borracha muito boa e com preço acessível. I am using it as my BH rubber on my BTY Primorac 5 ply wood blade. The sponge is very firm (or hard) with thin rubber sheet. It pairs well with flexible wood blade (or ALC blade). Depending on your level and stroke, it can be very fast yet controllable....and spinny. Has a feel of Chinese rubber without the tackiness and quality consistency. Good value for the money. 10/10 !! Thank you TT11 for your excellent service as always. I use this as a BH rubber for a more flexible blade. It gives me good control, spin & speed. Meet my expectation. Recommended !! otlicnaja nakladka na FH i BH. Не понимаю как в нем можно играть? Если сильно фиксировать, то невозможно сделать топспин, если слабо , то смысл его применения? Жесткая, не скажу что быстрая, брал 2.0 на основание Joola Rosskopf Emotion и BYT Boll Forte OFF, на первом села лучше.Спасибо за работу. Excellent feel, fast enough, reasonable price!. Thanks Tabletennis11 staff. The reviews speak for themselves with this rubber. One of the best if not the best in it's price range, I have noticed that it wears out a little faster than other rubbers but it is still worth it! This is only one of two rubbers that I have bought more than once. Excellent! Extremely good buy, if take into consideration the sale price. Gerat rubber, but a liiter heavy. Good quality product, a litter heavy rubber, if you have a blade of 85 gr may you will not like so much since those rubber going to make your blade more heavier than with Tenergy rubbers. Tabletennis has excellent price and fast shipping. I used this on Tibhar Samsonov Stratus CB on forehand and backhand. Previously I was using Rakza 7 Soft on forehand. While Vega Pro offers more control on your shots, the spin and spin is relatively lower as compared to Rakza 7 Soft. Because of control, push is very controlled and blocking is amazing. Being an intermediate player, I would advice to keep this rubber only on backhand. I use this 1.8mm in backhand. Easy to spin and block, control is super. Not too hard for me, blade is Timo Boll ALC. Good combination!! This is a medium-hard, heavy rubber; medium arc. And it's been fixing and helping me developing my damaged forehand for a year and a half now. Very consistent rubber, topspins and loops are perfect, all the same, every time. Has a lot of power to unleash, but Omega is more powerful. Stick to this rubber for a while and then upgrade to Omega... This rubber will give you high performance for a very low price. Lastly, my coach uses it on both fh and bh and loves them, and he's also been increasing his level tremendously, winning national tournaments this year. He's upgrading to Omega now, due to lack of power; I'm sticking to it at least 6 more months. поставил на butterfly innerforse al , контроль отлично, спин -- отлично очень!, скорость .... хорошо. Играю каждый день почти год, резина держится, качеств не теряет! Excelent quality, durable and very reliable rubber. Mediun arc, this rubber can attack, block, play mid and far distance... Everything. The only thing, if you are in full physical training and are in a high level, you may need more power from your rubber. Es un hule con buena velocidad y spin. Try it on xiom vega pro and euro blades. It was not spinny and also lacking in speed. Control is plenty. I need to match it up with some other blades. I'm sure right matching will realise its potential. Great rubber, excellent spin/speed/control. As for me, Xiom rubbers are high level quality and with adequate price. 6 месячная , битая перебитая T05 интереснее ,Игра вегой , навела на мысль иследовать другое направление рынка , более бюджетное . Been playing with Xiom Vega Pros for quite a while. Love these rubbers. This rubber has low trajectory, which requires great footwork to excel with this rubber. The spin for the serve is stunning, loops are great when you can make it to the table. I'm finding this rubber a bit too fast for my technique. In a few months I'll be enjoying it more. Nice quality rubber from Xiom. Good for offensive game style. Spin is ok. I use an allround medium wood blade with 2.0mm xiom v.p. Maybe a harder blade will play even faster then mine. I am a recreational player. I have found vega pro rubbers to be very good. Found these good for topspins but not for drop shots (may be my technique is not perfect). I will recommend it for others. Good rubbers with a decent price unlike the tenergy. Long lasting rubber.perfect replacement for the butterfly range. I play with defense balsa blade. Although 1.8 vega pro is excellent. Great price, good rubber so far. Have this on my BH now, switching to try from Vega Europe. Had to adjust hitting a bit, but does everything I want it to. I can't quite tell if it's got more speed than Vega Europe - but I'd say a bit more spin. 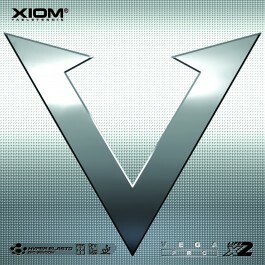 I have tried XIOM OMEGA V Europe FH on Kris Special Blade for a few weeks and I like it. I am not a good player with rating at 1400, and for me I feel it the same as Tenergy 05FX but more control with XIOM OMEGA V Europe. I don't mean it is better than Tenergy but at my current skill level, XIOM OMEGA V Europe is for me and I save money for another XIOM OMEGA V Europe. Vega Pro 2.0mm is a stiff rubber. Initially I had it on Tibhar Power Wood and it felt too hard for the limba surface, then I changed it to Butterfly Primorac Carbon with a soft hinoki surface and it is a great match. It's fast, grippy, and spinny. I also love the service from Table Tennis 11; they are great! I love this rubber. It has been released 6 years ago and it is still competing with any rubber from other brands.. A lot of people are using it despite the fact that new series of xiom is on the market. Amazing quality, high throw, astonishing spin. Perfect for topspin, good for flat hitting. Enjoy. Absolutely amazing piece of Rubber.Great spin for serves.Truly a tough competitor for the tenergy range.Thanks TT11. I can say this is a substitute to tenergy 05. You Can easily hit top spin play counters and do everything but I don't recommend to players who loop and hit drives to win a rally it's For the ones who play counters and hit toppings close to table. Накладки супер. Играю ними давно и других не хочу. Мой стиль - атака . Мяч сам попадает на сторону противника и играть даже не надо , играют сами. А если серьезно, много попробовал и эти - то что надо для меня. Спасибо. Удачи ВАМ! Приятно было с вами познакомиться. Виктор. Excellent overlays, some years I play only them. Magnificent feeling of a ball and confidence of accuracy of hit from any distance. And in a combination to basis Xiom Axelo - unsurpassed pleasure of game. What is necessary for entire happiness of the fan and the professional? Overlays play at once, even it is not necessary to "break". I recommend to all. Many thanks to shop. Very operatively delivered. Есть все обещанные производителем качества. А вот контроль превосходит обещанное и раздвигает границы возможнлстей аткуюшей резины. This is a fast rubber, but it has an excellent control. Perfect on the FH for an attack focused player. i have been playing with this rubber for about 2 years now and find it superb alternative to butterfly t-energy which i used to play with . i found xiom vega pro and have never looked back . if you are looking for an alternativeto t-energy then this is the 1 could be for you try and i am sure you will not regret it. You know always what to expect from Vega Pro. i have both side 2.0 pro on rw5 . adequte control, good spin and speed. a bit high throw angle, but lacks of feel. in close table game, it excells. tabletennis11.com is the best. great service. I have put one on FH and one on BH on a Xiom Zetro Quad blade as the manufacturer has recommended. I really don't find a significance difference between this rubber and Butterfly Tenergy series. i've uesed 3 sheets of this rubber, very good for my forehand and backhand with Innerforce ZLC. will try 2.0 for my BH next time. I bought this rubber and put it on my backhand. It is surprisingly good for its price. Lots of speed and spin, and also the feel is what I want, not too hard and not too soft. I would recommend this rubber to anyone playing with a carbon blade.